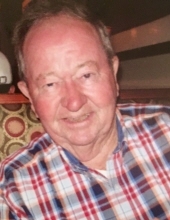 David Davidson, age 88, of Madisonville, passed away December 4, 2018 at his home in Madisonville. Funeral services are planned for 11 A.M., Friday, December 7, 2018 at Madisonville Funeral Home in Madisonville. Interment will be in Mt. Tabor Cemetery. The family will receive friends from 4 P.M. to 6 P.M., Thursday, December 6th at the funeral home. David Chester "D.C." Davidson was born September 29, 1930 to Frank & Benna Beatrice (Bennett) Davidson. He married Doris Marie Key June 10, 1950 in Many, Louisiana. D.C. worked for Southwestern Bell Telephone for thirty-four years. He was a Pioneer with SWBT and a Master Mason with the Grand Lodge of Texas No. 740. D.C. enjoyed golf, traveling and being with his children. He had resided in Madisonville since 1975 and was a member of Holy Innocents Episcopal Church in Madisonville. D.C. was preceded in death by both of his parents; brothers, Frank G. & Phillip D. Davidson; mother-in-law, Hazel Neel and brothers-in-law, Joe Key, Joe Barclay and Melvin Herbert. Surviving family includes wife, Doris Davidson of Madisonville; children, Michael R. Davidson (Teresa), Pattye D. Jordan (Norman), Lissa J. Davidson and Terry D. Davidson (Robin) all of Madisonville; sisters, Jeanie Newton of Houston, Ellouise Hebert of Madisonville and Paula Jacks of Nebraska; grandchildren, Keisha Clement, Derek Jordan, Angie Jordan, Andrew Jordan, April Covington, Mike Davidson, Jr., Anna Gonzales, Brandi Davidson, Dustin Davidson & T.J. Davidson; great grandchildren, Kaleb, Kane, Kennedy, Kameron, Victoria, Connor, Camden, Mara, Mia, Macy, Chance, Haze, Bannon, Maddox, Marcus, Jace, Martin, Christian, Brianna, Dani, Katrina, Dianna, Aiden, Kadence & Teresa and great, great grandchildren, Keylee, Joseph & Cruz. To send flowers or a remembrance gift to the family of David Chester "D.C." Davidson, please visit our Tribute Store. "Email Address" would like to share the life celebration of David Chester "D.C." Davidson. Click on the "link" to go to share a favorite memory or leave a condolence message for the family.